FARMERS’ MEETING FOR THE PRESENTATION OF RESULTS AND EXCHANGE OF INFORMATION ABOUT ARABLE CROPS. 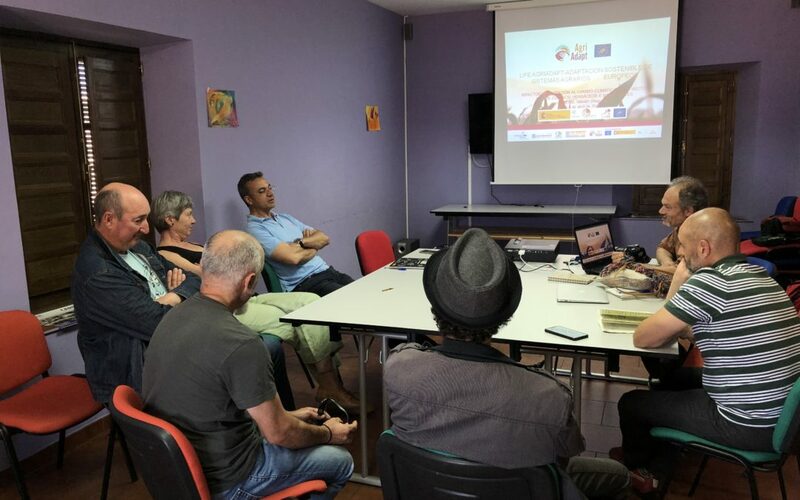 In this meeting, held on the 18th of June, the results of the different assessments of vulnerability to climate change for the 6 pilot farms of arable crops in Spain (cereals, legumes and oilseeds), have been presented. Based on these assessments, information on possible adaptation measures that could be implemented in the coming months has been shared with farmers. During the day there has been an enriching debate between the different farmers on the possible measures and solutions to obtain more resilient farms. The main conclusions presented were that cereal crops are very vulnerable to climate change, not only because of declining water availability but also because of the expected increase in temperatures in the near future. The main agroclimatic indicators that will affect cereals are the heat waves at the end of April and the beginning of May, moments in which maximum temperatures above 30º C during 2 or more days affect the yields considerably, when provoking the shrivelling of the grain in its filling phase. Regarding oilseeds, such as sunflower, although it is a crop more adapted to periods of drought, it will also be affected by the increase in temperatures. The thermal stress will affect a decrease in yield due to impact on the flowering and fattening of the pipes. On the other hand, although sunflower has a good resistance to water stress, since it is able to keep stomata open for a long time, it requires a greater accumulation of rainfall between April and August for better yields. Therefore, sunflower also has a high vulnerability to climate change, although it is less than cereals crops. Regarding the forage crop, although the main impact will come from a thermal stress in May, intense rainfall in spring or after sowing, in November, could affect these crops. In principle, forages are more resilient to climate change.